When Was The First Blood Transfusion Performed? 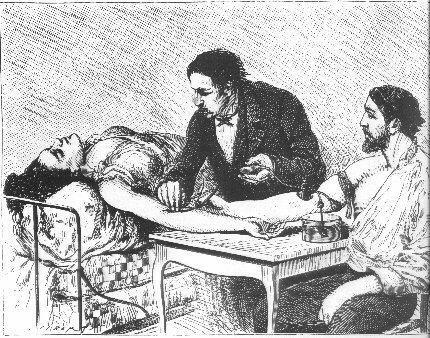 Home > Adam's Blog > Adam's Updates > When Was The First Blood Transfusion? When Was The First Blood Transfusion? Who performed the first blood transfusion? Are there complications with blood transfusions? What are the blood transfusion guidelines? Are blood transfusions required during open heart surgery? These are great questions. However, I’m not going to address all of these questions in a single, very long post. Instead, I’m going to answer these blood transfusion questions one-by-one over the next month in multiple blogs. To start though, I’m going to write about the history of blood transfusions. Specifically, I am going to offer research about the first blood transfusion. The utility of blood transfusion processes and technology is similar to most medical advancements in that it has been ongoing, or evolutionary, since the 15th century. That said, I located five of the most relevant “firsts” in blood transfusion capability. The first historical attempt at blood transfusion was described by the 15th-century chronicler Stefano Infessura. Infessura relates that, in 1492, as Pope Innocent VIII sank into a coma, the blood of three boys was infused into the dying pontiff (through the mouth, as the concept of circulation and methods for intravenous access did not exist at that time) at the suggestion of a physician. The boys were ten years old, and had been promised a ducat each. However, not only did the pope die, but so did the three children. The first fully-documented human blood transfusion was administered by Dr. Jean-Baptiste Denis, eminent physician to King Louis XIV of France, on June 15, 1667. He transfused the blood of a sheep into a 15-year old boy, who recovered. In 1818, Dr. James Blundell, a British obstetrician, performed the first successful blood transfusion of human blood, for the treatment of postpartum hemorrhage. He used the patient’s husband as a donor, and extracted four ounces of blood from his arm to transfuse into his wife. During the years 1825 and 1830, Dr. Blundell performed 10 transfusions, five of which were beneficial, and published his results. He also invented many instruments for the transfusion of blood. While the first blood transfusions had to be made directly from donor to receiver before coagulation, in the 1910s it was discovered that by adding anticoagulant and refrigerating the blood it was possible to store it for some days, thus opening the way for blood banks. The first non-direct transfusion was performed on March 27, 1914 by the Belgian doctor Albert Hustin, who used sodium citrate as an anticoagulant. The first blood transfusion using blood that had been stored and cooled was performed on January 1, 1916. Oswald Hope Robertson, a medical researcher and U.S. Army officer, is generally credited with establishing the first blood bank while serving in France during World War I. As you can tell, the word first is used several times above to describe each particular instance of blood transfusion history. No doubt, the steps leading up to the blood transfusions administered today were multiple. That said, I would suggest that the first blood transfusion did not occur in one specific moment. Rather, the first blood transfusion was a collection of efforts and research by many medical pioneers. In the next blog on this topic, we will investigate the modern era of blood transfusions and the use of blood banks. Thank you for writing about this. Since Jon has it vavle repair in Oct. and his blood transfusion I have been very concerened. I have asked the doctors if he should have blood tests to test for HIV in the next few months…they all say no. I am not sure I agree with that. Jon is not worried and it did make him feel better after he got the blood…but I am still worried….cant wait to read more…THANK YOU!